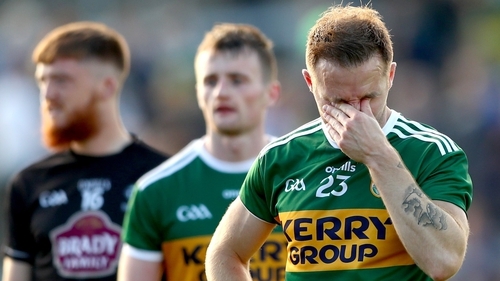 A Pyrrhic victory for Kerry who, despite beating Kildare by 12 points, have lost out on a place in next weekend's All-Ireland SFC semi-finals for only the third time since 2000. All-Ireland quarter-final defeats in 2010 and 2012 are now joined by 2018, as Monaghan's win over Galway has ended Kerry's involvement in the championship. Kerry knew their championship survival would be determined in Salthill as much as in Killarney and so it came to pass despite this big win over a Kildare team that finished with 12 players at the end, after a couple of red cards and a late black card. What Kerry take from this performance into a winter of introspection is for another day but this was a patchy performance from the hosts, at least until Kildare were reduced to 14 men just before the interval. Thereafter Kerry produced some decent football but they will take little, if any, consolation from what has been a very poor Super 8s campaign. All of the drama was reserved for the last 10 minutes of the first half when Kildare momentarily opened up a six-point lead but then had goal scorer Neil Flynn sent off on a straight red card. Full back David Hyland followed soon after for a black card offence. Flynn's goal came in the 31st minute when he easily turned Jason Foley and dispatched it past Brian Kelly to make it 1-9 to 1-6 to the visitors, after David Clifford's penalty seven minutes earlier had hauled Kerry back on level terms, 1-5 to 0-8, after a lifeless start from the home side. Kerry never led in that first 25 minutes as Kildare looked like the team chasing a place in the All-Ireland semi-finals, with Paul Cribbin kicking some brilliant long range points. Trailing by three David Moran was bundled over to win a penalty, which Clifford coolly placed past Mark Donnellan, but Kildare reacted like a team with plenty to prove, and two fine Cribbin points had them 1-12 to 1-6 ahead with Kerry at sixes and sevens all over the field. Flynn's sending off came in the 35th minute with Sean O'Shea (free) and Clifford mining late points to leave Kerry trailing by four at the interval. Kerry made their numerical advantage tell in the second half, and they got the perfect start when Clifford capitalised on a Donnellan mistake to roll his second goal into an empty net, and Geaney soon had the scores level, 2-9 to 1-12. Thereafter it was all Kerry as they finally found their rhythm, with O'Donoghue's goal in the 45th minute easing fears that Kerry might win but by not enough. In the end, Kerry needn't have worried about doing enough to boost their scoring difference, and as word filtered through of Monaghan's win over Galway, the final whistle in Killarney was greeted by stunned silence from the Kerry supporters who made up the vast majority of the 18,000 there to witness the end of Kerry's summer that will bleed into a long winter of discontent. Kerry: B Kelly; J Foley, P Crowley, T O'Sullivan; P Murphy, K Young, G White; D Moran 0-01, J Barry 0-03; M Burns 0-02, S O'Shea 0-05 (0-03f, 0-02 '45'), S O'Brien 0-01; D Clifford 2-06 (1-00pen, 0-01f), K Donaghy 0-01, P Geaney 0-02 (0-01f). Subs: Kevin McCarthy 0-01 for K Young (HT), James O'Donoghue 1-02 for K Donaghy (HT), Darran O'Sullivan for M Burns (57), Tadhg Morley 0-01 for J Foley (59), Anthony Maher for S O'Shea (67), Brian Ó Beaglaíoch for G White (inj, 69). Kildare: M Donnellan; P Kelly 0-01, D Hyland, M O'Grady; J Byrne 0-01, E Doyle, K Flynn 0-01; K Feely 0-03f, T Moolick 0-01; F Conway, P Cribbin 1-05, K Cribbin; N Flynn 1-03 (0-01f, 0-01 '45'), N Kelly 0-01, P Brophy.